A Rossville man was arrested Dec. 9 after allegedly shooting his uncle during an early morning domestic dispute, police say. According to Catoosa County Sheriff Gary Sisk, 37-year-old Bounmy Manhrasamy of Rossville is being held without bond at Catoosa County jail while facing charges of murder and possession of a firearm during the commission of a crime. Sisk says the Catoosa 911 Center received an "active shooter" call at 9:14 a.m. Sunday advising that one man was wounded and that the shooter was still inside the residence at 218 Steele Road in Rossville off Mack Smith Road. "Upon deputies' arrival, the shooter (Manhrasamy) exited the residence and surrendered to law enforcement," Sisk said via press release. "Deputies entered the residence and located the victim, identified as Somvang Vorachak with a gunshot wound to the chest." Sisk says deputies began giving first aid to Vorachak until EMS arrived, but that the 60-yearold succumbed to his injuries. Sisk said Manhrasamy was the nephew of Somvang Vorachak. "The two lived in the same residence and were having a domestic dispute which led to the shooting," Sisk said. Catoosa County Public Schools has launched its participation in a new community program geared toward helping local students in need. Purposity, a program that finds purpose through generosity, gives community members the opportunity to anonymously help students and others who may need assistance through an online portal. The program involves teachers and administrators providing Purposity with details about the needs of a student or individual in the area, and then the organization feeds those stories into a network where those signed up can choose to help assist with those needs. For example, if a teacher discovers that a student is in need of a winter jacket, the teacher can submit a request for assistance for that child. After that, a weekly notification will go out to all the people signed up for Purposity and give any of those people the chance to choose to fill that need by purchasing a jacket for that child anonymously. According to Catoosa County Schools social worker and Homeless Liaison Melissa Holcombe, the program allows community kindness to exist without compromising the confidentiality of the student or person in need. "We know that students need to have their basic needs met before they are able to focus on learning," Holcombe said. "Purposity allows the community to assist students and their families by meeting some of those basic needs." The school also acts as a catalyst to make sure the information and items are secured for the students. "If a child needs shoes, the need can be placed on Purposity with a short explanation of the situation and sent out in the weekly text," Holcombe said. "Community members will have the opportunity to then purchase the item through Amazon, and the item is sent to the school. Purposity allows people to feel a connection with the person in need without breaking confidentiality. No identifying information about the giver or the receiver is shared." The Purposity program really took off a few weeks ago when Ringgold Mayor Nick Millwood, a middle school math teacher, shared information about the program on social media. For a community to utilize Purposity, it must have 500 people signed up through Purposity.com. Catoosa eclipsed that mark within 48 hours and currently has more than 850 registered to help. Millwood thinks the program will mean a lot to the community and the kids that'll benefit from it. "The people most likely to identify those needs (our teachers, administrators, and counselors in the schools) actually have a community-wide tool to access help for our kids and families that are in the greatest need," Millwood said. "It also means that kids will see how compassionate and loving their community can actually be now that we have the ability to ease the suffering and embarrassment kids experience because of life situations they have no control over." Holcombe says that different businesses and organizations can help sponsor the program, and that some already have. "Georgia Power felt so strongly about the need for the program, they sponsored the entire state of Georgia," Holcombe said. "So every part of the administration of Purposity Catoosa is covered. All that is needed are participants to purchase the items." In addition to local students, Holcombe says Purposity Catoosa will also help others in need. "While our focus is on student's needs and the needs of their family, we are taking requests for the elderly and others in need," Holcombe said. "Those requests will be through Ringgold United Methodist Church. We are hoping to send out first text this week." Those interested in assisting with Purposity can sign up for the weekly texts to assist individuals in need at Purposity.com. "When you enter your cellphone number, you will be allowed to choose Catoosa as your community," Holcombe explained. "There is absolutely no obligation in signing up, you will just receive the weekly list and you choose to help with the need that touches your heart. Anyone with additional questions about the program can contact Holcombe via email at mholcombe@catoosa.k12.ga.us. 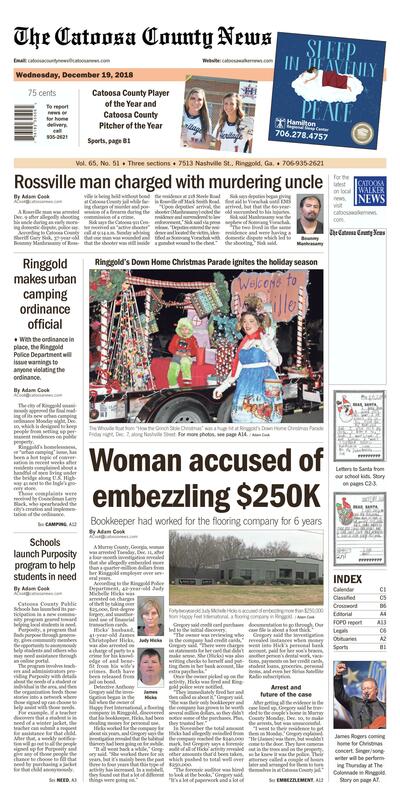 The Whoville float from "How the Grinch Stole Christmas" was a huge hit at Ringgold's Down Home Christmas Parade Friday night, Dec. 7, along Nashville Street.